In the morning of 20/01/2014, Center for Rural Development in Central (CRD) has held a meeting to establish a network of Climate Change (CC) and disaster risk reduction (DRR) in Central. Attending in the meeting, there were representatives of Plan organization, Malteser International (MI), Norwegian Church Aid (NCA), and Centre for Sustainable Rural Development (SRD), Consultative and Research Center on Natural Resource Management (CORENAM) and CRD. The meeting aimed to share information and discuss the establishment of network of CC and DRR in Central. Simultaneously, discuss to agree with a draft organizational mission of the network, establish an action plan in the future of the network and of the project. At the meeting, representatives of CRD pointed out that it was necessary to establish a network of Climate Change in Central. According to the report, in the years 1995-1999, Central was affected by 13 hurricanes, 5 tropical depressions, and 23 northeast monsoons. In 2006, 2010, and most recently (2013) is the typhoon no. 15 caused severe consequences for Quang Binh, Quang Tri, Quang Ngai, Binh Dinh provinces… However, there were plenty of agencies, organizations sponsored for Central to disaster risk reduction, adaptation and mitigation of climate change, but efficiency was not high. The results have not been shared and replicated. Contribution of the organizations in the Central area to the community has not really been adequate with their potentials. Therefore, it was necessary to have connections, sharing of experiences and resources. Also at this meeting, the stakeholders approved the basic terms of the network with name “Climate Change Central Network” (CCN). The network established for the purpose of “Link and mobilize resources in order to contribute to mitigate vulnerabilities, strengthen resilience and recovery of communities in Central Vietnam in front of the impacts of natural disasters and climate change”. 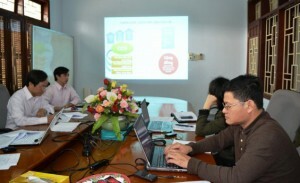 The core organizations of the network included CRD, MI, NCA, CORENAM and Green Viet. The network will meet quarterly. In 2014, Plan organization committed supporting to the CCN via CRD to implement some activities strengthening the connections, capacity building and information sharing. /.